In the face of the political and institutional difficulties implied by the modification of the treaties voluntary cooperation is developing independent of these or as part of them. The Lisbon Treaty plans for "enhanced cooperation" and "permanent structured cooperation" in terms of defence. The idea is to inspire European behaviour and practices with "the freedom for some to undertake action and the impossibility for the others to prevent this" so that Member States can go further with regard to integration with those who agree without the others opposing this with their right to veto, which impedes progress on the part of the community. This "differentiation", which already exists, is the focus of a number of ideas and proposals. 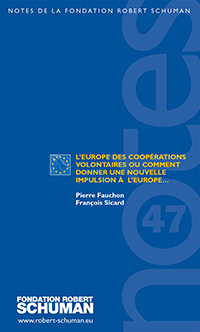 Pierre Fauchon and François Sicard lay out perspectives, working on how the construction of a more unified, stronger Europe can continue, grow in intensity and be improved.